Google just killed Android Nearby Notifications. What’s next for proximity marketing using beacons? On October 25th, 2018, Google announced that Android will discontinue support for Nearby Notifications from December 6th, 2018, citing misuse of the service resulting in irrelevant and spammy marketing messages being delivered as notifications on Android phones. It is unfortunate that Google chose to entirely shutter the service instead of working on improving the end-user experience and implementing mechanisms that can easily and effectively address the spam problem. Throughout the time Nearby Notifications was in existence, Google made almost no effort to improve documentation or clarify to marketers how best to make content relevant and timely. Nevertheless, this was an important innovation in the proximity marketing space, and we thank Google for its efforts. Google discontinues Nearby for Android. Does this mean proximity marketing is no longer viable? Proximity marketing is more relevant than ever. Physical stores continue to exist and ad relevance is crucial especially because of how important customer delight is over mere customer satisfaction. 71% of respondents said they would prefer ads that are tailored to their personalized interests and relevant to where they are. Google Nearby was just one of the many channels available to receive beacon notifications. Although Nearby services have been disabled, there are more than a few proximity marketing apps available on the market. What’s next for beacons? Alternatives to Google Nearby. Beacon campaigns integrated with brand apps are the best performers. This is because these campaigns are extremely relevant and contextual. Also, the user has absolute control over what notifications she receives – either turn off notifications or uninstall the app if they find it irrelevant. Don’t have an app but want to build one? Head on over to our DIY beacon app builder in partnership with Shoutem that allows you to create apps easier, faster and at a fraction of the cost. You can build completely customized apps without the help of a developer within minutes and publish it on the Google’s Play Store and Apple’s App Store. What if you want to manage the entire life cycle of your app? Or, if you already have a developer’s team? Beaconstac’s new partnership with Kumulos will help you manage both the technical and commercial side of your app. Sign up for a 30 day free trial with Kumulos and build beacon apps 40% faster with their drag and drop UI. Beaconstac’s NearBee app initially released on iOS was created to circumvent a two-fold problem. iPhone users had to download different apps for different businesses in order to receive beacon notifications and brands had to create an app that could scan for beacons and deliver notifications, a tedious task requiring significant developer effort. NearBee was created to deliver the perfect beacon marketing experience on both Android and iOS. Why is NearBee superior to Google Nearby? NearBee solves all the problems that Google Nearby Notifications may have posed. It is intuitive, gives the user a rich experience and is contextually relevant. On Google’s Nearby service, all notifications are silent notifications delivered directly to the notification tray. That means a user can potentially miss out on a relevant opportunity because the notifications do not send them any sort of alert. However, with NearBee, users are alerted either through a vibration or an audible alert when they receive notifications. This means they will no longer miss relevant notifications or miss out on exciting deals and offers. On Nearby, all a user was able to see was a title and a description which would most likely be cut off because of the character limit and not know what the notification was about until they clicked on it. Google Nearby notifications may have been a source of annoyance to several consumers because as long as they were in the range of a beacon, they would keep receiving the same notification over and over even if they did not find it useful or relevant. However with NearBee, once a consumer opens a notification, they will not be bothered by that same notification again unless they re-enter the range of the beacon. For instance, if a user is in a cafe all day long, he/she will not receive the same notification once it has been viewed. Google Nearby notifications were only available in the Nearby section of settings and did not appear on the lock screen. But, with NearBee all notifications appear on the lock screen of Android and iOS devices. Update: The new version of NearBee with all the future updates will be rolled out soon. Google Nearby was a service in-built in all Android smartphones that allowed users to receive notifications as soon as they came into the range of a Bluetooth beacon and had their location and Bluetooth on. Nearby was disabled on December 6, 2018. Google sent out free Google beacons to business owners allowing them to leverage proximity technology in their physical stores. Are your Google Beacons useless? No. You can continue to use the Google cloud platform and integrate your beacons with NearBee, a hardware agnostic app, to send notifications to your customers. The end user needs to download NearBee on their phone. Alternatively, you can build your own app and integrate our SDK in it. Give NearBee a shot now, and tell us what you think we can do better. We look forward to working with all ecosystem players to accelerate proximity marketing around the world. Talk to us about how you can make the shift from using Google’s Nearby service to NearBee for Android. 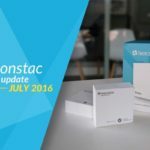 Beaconstac Product Update: No more duplicate notifications for your campaigns!